THIS ship is called the Criollo Fiel or more familiarly, Faithful Creole. She was built on the Tees at the yard of the Furness Shipbuilding Company, to the order of the Standard Shipping Company of New York for one of its South American subsidiaries, and designed for service on the Parana River. We have called her a tropical service ship because she is almost identical with those vessels which bring the crude oil across shallow Lake Maracaibo (Venezuela) to the refineries at Aruba, where their contents are made into petrol and lubricating oil for shipment overseas. The duties of the two types of vessel are largely interchangeable. The Criollo Fiel is therefore a special service tanker, and, since she was built with the initial idea of carrying crude oil, steam is employed for propulsion, because this is necessary for pumps and for heating tanks. 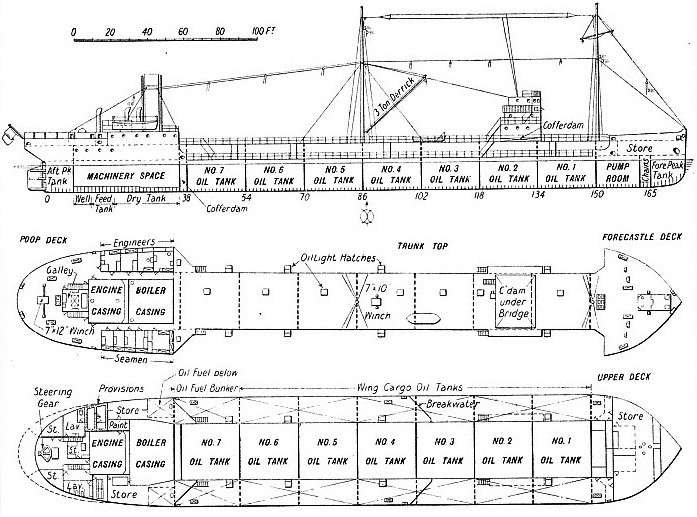 The ship is particularly interesting because of the remarkably short time occupied in her construction. She was brought to the launching stage in a little over fourteen weeks, and, when launched, was practically complete except for her propelling machinery. This was afterwards installed by the North Eastern Marine Engineering Company, Wallsend-on-Tyne. The completion then occupied three weeks. The Criollo Fiel has an overall length of 362·75 feet, a beam of 60 feet, and a depth of 17·5 feet. When fully loaded with 5,350 tons of crude oil she draws 15 ft 3½-in water, and has a corresponding speed of about 10½ knots, which is given to her by means of two sets of triple-expansion steam reciprocating engines having cylinder diameters of 16-in, 26-in and 43-in, with a common piston stroke of 27-in. These engines are designed to develop a total ihp of about 1,700, and take steam at 180 lb. per sq. in. from ordinary Scotch multitubular boilers burning oil fuel. The vessel is called a trunk deck type ship, having an expansion tank for the oil on the centre line, but no tanks at the side of this; when fitted these are known as summer tanks. There are two fore-and-aft centre-line bulkheads forming seven sets of triple tanks. The propelling machinery is arranged aft, and the pump room is forward of the cargo oil tanks. Oil fuel bunkers are arranged at the sides of the machinery space and alongside the aftermost centre cargo tank. The cargo and fuel oil tanks are provided with fire-extinguishing apparatus. The accommodation is specially arranged to meet tropical conditions and is entirely aft, although the navigating officers’ quarters are arranged forward of the midships in a special bridge house. There are two masts, the aftermost of which has a 3-tons derrick for handling cargo hoses and for putting any necessary gear on the deck. You can read more on “The Development of the Oil Tanker” on this website.